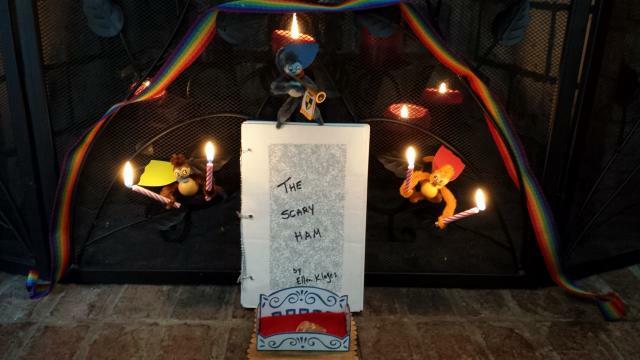 If you were at last year’s Nebula Awards, you were treated to award-winning author and raconteur Ellen Klages‘s tale of “The Scary Ham.” Go read it now, or watch it here starting at 12:57. We’ll wait. 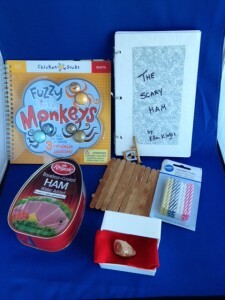 Being that Ellen is as generous as she is funny, she offered to recreate The Scary Ham Experience with a Do-It-Yourself Scary Ham Funeral Kit for one of our Kickstarter backers. We thought it would be fun as a backer level, but we didn’t expect anybody to actually go for it. We were so wonderfully wrong. Ellen scoured her area for a one-pound canned ham, visiting multiple grocery stores and nearly giving up and substituting either Spam or canned mutton. Thankfully, she found the perfect ham. So I assembled the monkeys and decided to stage a dramatic reenactment of the climactic funeral scene from Ellen’s story. The monkeys are wearing capes (they came with the kit), because I felt it added much needed gravitas to the scene. The blue monkey is playing the horn Ellen included while the other two have the birthday candles ready to send the ham off over the rainbow bridge. The coffin is a “monkey swing” from the kit, the funerary raft Ellen made. The rainbow bridge is symbolized by the rainbow webbing strap draped over the fireplace screen, which itself symbolizes the world tree to make it even more Viking-ish. Once I clear off the mantle, book, monkeys, and rafted (faux) ham will have a place of honor there with the possible addition of a canned unicorn in the future. I also really wanted to explain why I chose the Scary Ham reward. When I read Ellen’s story I had tears in my eyes even as I laughed, because I could relate so well. My dad and I weren’t very close, and he died suddenly in 2011. Dad was a carpenter and had pretty much rebuilt the house I and my much older siblings had grown up in, and I had often half-jokingly said we would have to burn it down Viking-style when Dad went. Reading Ellen’s story was like revisiting the aftermath again, in a good way. Thanks to Ellen Klages, for the story and the kit, and to all the Uncanny people. If you want to read some of Ellen Klages’s amazing fiction, Uncanny Magazine will be reprinting her classic “”In the House of the Seven Librarians” in Issue 3!